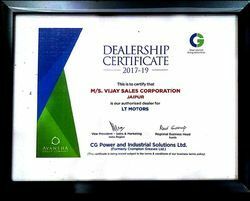 Walking ahead with a vision to serve utmost qualitative facilities to our clients, Vijay Sales Corporation was founded in the year 2001, since then we are known as a leading wholesaler, trader and supplier of a quality approved collection of Ceiling Fans & Motors. All our products are known for their quality performance, as we are serving our clients from more than 10 years that mainly include Pressure Boosting Systems, Monoset Pumps, and V-Guard Stabilizers. These products have been manufactured with utmost precision using finest quality raw components which we source from the trusted vendors of domain. Our products are appreciated a lot in the market sphere for their hassle free operations & competitive price ranges. We ever try to match up with the international market standards so that we deliver the best array of products from our side to the clients end. We are offering these products in different technical specifications, so that our clients have end number of options to choose from. We are the owner of a well equipped infrastructure facility from where we render qualitative range of fans, booster and motors in varied forms. In this entire process our team of talented professionals helps us a lot and gives their best performance to assure quality in the provided product range. We deals all the products in Brands Cromptom, V-Guard, Grundfos, Marc and Polar. We are leading to the path of success which is all possible by the sheer efforts of Mr. L.K. Gupta (CEO) who is graduated from top business university & have immense experience in similar domain. He always tells us to remained focus toward our organization goal that is to provide our clients with the qualitative & prominent products which lead us to achieve the full satisfaction of our clients in a significant manner. Trading of Table Fans, Pedestal Fans, Wall Mounting Fans, Crompton Greave- Pumps, V-Guard Pumps and Motors and Geysers. A Fair Profit for All. Outstanding Quality and Best Value. Continuously maintaining the higher level of Integrity with Our Vendors, Our Customers and Among Ourselves. The team works in a synchronized manner and ensure fast and better business results. Moreover, we organize training sessions for our employees that keeps them abreast about the latest technological advancements in our related fields. Further, we promote healthy working environment at our organization motivate our professionals to give their best.